Many thanks to Fiona Hailstone who saw this lovely image in her minds’ eye when attending an Ascending Hearts event in Auckland. 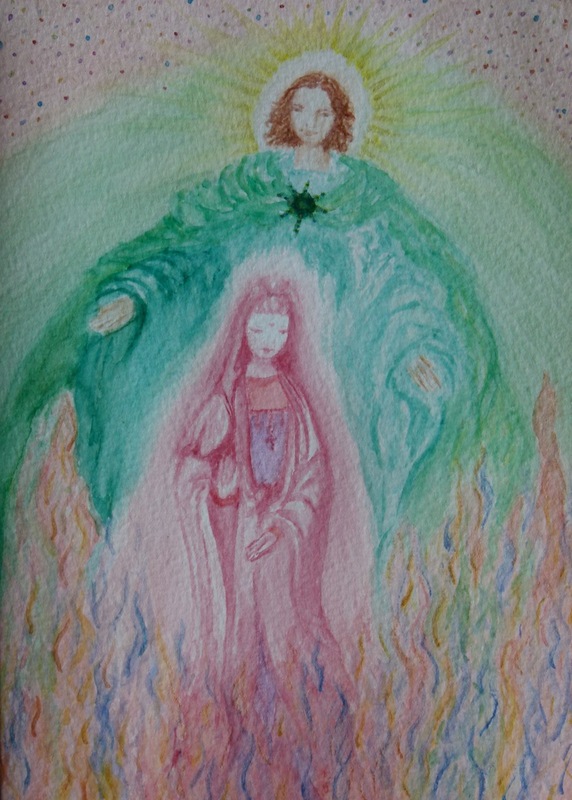 We can see Quan Yin with Archangel Raphael behind her, with the colourful dots in the background representing the collective consciousness known as ‘Katoosh.’ In the foreground we see the three-fold flames of Divine Love, Divine Wisdom and Divine Power. “Ascending hearts is a daily practice for me to use; it is a pleasure and the results and growth that come from it are incredible. I am a mother of three young children, and my windows of time to myself can be scarce. This practice fits perfectly into my daily routine along with my teachings and practices that I am already doing. I highly recommend this to anyone who is wishing to clear and transition through any deep blockages and elevate themselves at this pivotal time. I have deep gratitude for meeting Annwyn and to have received this precious gift from her.” Amanda H.
“I commend all you have said Annwyn; having attended your event, within two weeks amazing changes and very noticeable physical healing, a sense of peace and calm, along with more insight and awareness of what my life’s last year’s journey has been all about.” Valda S.
“I love the work that we did yesterday. I feel quite different. Joyous and confident today. There’s a layer of something that I didn’t have before. Thank you.” Warwick P.
“Since the workshop I have been surrounded by palpable light …. everything is glistening and I am aware of riding a different vibration. And magic is abundant……With aroha and gratitude for the many gifts of awareness.”……Heidi M.
“Thank you, thank you, thank you……I can never thank you, Quan Yin, Archangel Raphael & Katoosh enough. I feel that I’ve jumped into a new paradigm…..my old life is slipping away. The most incredible change I’ve noticed is in my healing abilities. WOW – it’s certainly gone to the next level (blowing myself away), and I’m also experiencing wonderful synchronicity in many areas of my life.” Karen B. “Truly Annwyn….. if it had not been for your healing help your unconditional love and introduction to Quan Yin’s special healing meditation which has been the real culmination and clincher of all the earlier work…I think my journey would have taken a different route….possible down the medical/chemical track which once embarked on, would have totally stunted my spiritual growth.” Valda S.
“Thank you Annwyn for the forwarded audio. This morning I was up early to go through the attunement process and was delighted to hear – can’t say I recall hearing this normally where I live – an owl calling! I really appreciated this sign of confirmation for me doing this work. Thanks again for a beautiful, spirit filled day yesterday Annwyn. I will honour and treasure my learning and experiential connection with Lady Master Quan Yin.” Maria G.